With a seating capacity of over 9,000 the Red Rocks Amphitheatre has a wide selection of seating option, with a great view of the surrounding rocky plains of Colorado, what better way to see your favorite artists perform live! Mostly general admission seating in the green indicated below with reserved seating surrounding the outer edge in blue. Disabled seating is also situated at the rear of the general admission seating. For rock orientated concerts there is a Pulpit close to the stage, for those who like to get in the thick of it! Please be respectful of other patrons and use the designated smoking areas at the rear of the venue. Smoking is strictly prohibited in all seating areas. Please be aware that ticket prices will vary per seating area. Access to Row 1 Accessible seating is via shuttle from Upper South Parking Lot. Access to Row 70 Accessible seating from the top Circle Lot. Please note that for some Red Rocks shows Accessible seating in Rows 1 and 2 will be Will Call only as the only method of delivery available. This information will be listed in the PLEASE NOTE portion on the Event Detail Page. HANDICAP PARKING MUST HAVE APPROVED A.D.A. 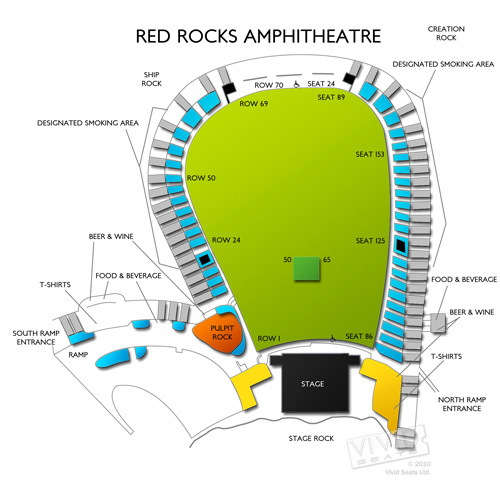 Got some more questions about the seating at the Red Rocks Amphitheatre? Then head over to the contact page and use the number provided for more info!